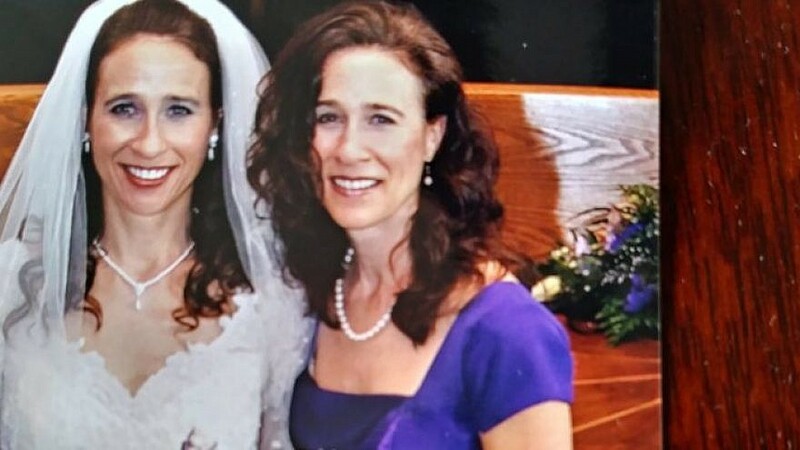 Kathleen Luken (left) in her wedding dress with her twin sister, Kristine, who was murdered in Israel by Palestinian terrorists in 2010. It was the last time she and her sister were together. Courtesy: Kathleen Luken-WIN. Kristine Luken was killed in the Jerusalem forest in 2010 by Palestinian Arabs who believed that she was Jewish. Her identical twin sister, Kathleen, recently spoke with World Israel News about the impact of that tragedy. (April 15, 2019 / WIN) Two Palestinian Arabs brutally murdered Kristine Luken on Dec. 18, 2010, in the Jerusalem forest just off the Israel Trail, and left her friend and tour guide, Jerusalem resident Kay Wilson, for dead. She was killed simply because these two men thought that she, like Kay, was Jewish. What does the publication of Kay’s memoir mean for Kristine’s twin sister, Kathleen? How has she coped these past years since the murder? Q: Do you think you will read Kay’s book? A: When our family received Kay’s email a few weeks back with the draft memoir for our review, I shared with Kay that I would not be reading it. I also shared that I had chosen over these years not to read anything she has written or see any of her talks on the tragedy. I didn’t want to put any more images in my heart and mind than were already there, and those I imagined based on what I heard, much of it not by my choice. All I had heard and then imagined was more than enough for a lifetime. Our journeys through grief are as unique and different as we are as individuals. I have seen this in my own family. There is no right or wrong way to grieve, just as long as you don’t get stuck. I think it is important to talk about our grief and loss. Looking back, I should have done so but I wasn’t ready and didn’t know how. For instance, it took me seven years to be able to say my sister’s name with a measure of ease. Until recently, I think I hid behind calling her “sweet sis” to hold back tears, grief and the reality of the loss—self-protection honestly. Kay’s memoir is a picture into her heart, her trauma and how she has processed the tragedy. I hope the memoir has brought healing. My family and I lost my sister horrifically and grieve deeply but we did not experience and survive an attack. The particular horror that Kay experienced is complicated and different—not less, just different. Q: You did not come to Israel with your parents for the trial of your sister’s murderers. What was it like for you during that time? A: For many reasons, I chose not to go to Israel for either the trial or sentencing. As I recall, they were so close in time to my sister’s tragic passing. I was in shock and grief, and I had no desire to be physically in Israel and face to face with the perpetrators. It was too much, too soon. I hesitate to tell you this, because it might be discounted since I didn’t suffer the attack myself … I had thought in those early days, months, that I had a sort of PTSD. That was what I concluded myself – the fear of me being attacked, the trauma and horror of what happened to my sister, thinking the men would come after me now. It was irrational but it was the shock and trauma of it all. Not sure if I am describing well why I felt that way but trying. Sometimes you just can’t put it into words. Does that make sense? And when I was finally able to put into words what I was feeling and experiencing, it brought relief. To put words to my feelings. Q: I understand that you and Kristine are devout Christians. Was your faith challenged in any way by her murder? A: My sister and I shared a strong faith in God. … When she suddenly passed away, and in such a manner, it was like the rug was pulled out from under me and my faith. I was in turmoil and in a tail spin. God has been patient and faithful in my wrestling and has never let me go; He stayed the same. God’s love gently drew me back to Him over the years, slowly healing my broken heart. My heart was shattered in innumerable pieces like a broken mirror. I didn’t think I would ever smile or laugh or have joy again. God gave me the courage to carry on. Like the poem “Footprints,” the only prints in the sand were His as He gently and tenderly carried me in my grief. Q: Has your sister’s murder affected your perception of Israel? A: My perception of Israel did change with the tragedy. After becoming a believer. … I had an increasing desire to visit the land of the Bible and walk where Jesus walked and see the Bible brought to life and in color. After the tragedy, my heart slammed shut and I declared I would never go to Israel and had no desire to do so. I was afraid and felt it was unsafe and feared for my life if I went to Israel. Attacks on innocent people just confirmed my decision. I heard of many churches doing tours of Israel and I feared for them. The unknown, the potential of an attack, frightened me. Q: How do people react when they find out how your sister was murdered? Which responses are the most helpful for you? A: Many people spoke words of comfort to me as I grieved. Some were helpful and many left me feeling hurt. I wanted comfort and understanding. Such a tragedy leaves you speechless and people don’t know what to say. It has been a very lonely, difficult journey. A journey I didn’t ask to embark on but was thrust into without a choice. There are no blueprints on how to navigate grief. I wasn’t prepared, as silly as that sounds. I had to traverse loss and grief for the first time as I lost my identical twin sister. The place and manner of her passing made it exponentially more difficult and complicated. I was reminded much through it all that I had to keep moving and not sit down. Psalm 23:4 often came to my mind: “Yea, though I walk through the valley of the shadow of death, I will fear no evil; for thou art with me; thy rod and thy staff they comfort me,” the key word being “through.” I had to keep walking and not sit down in sadness although I did do that for quite a while if only in my heart. I knew I could not stay that way, that there was a danger in doing so. Q: How has your sister’s murder affected your perception of the world? Of interpersonal trust? A: After the tragedy, I was filled with fear and distrust. It was a personal, violent, evil and senseless attack on Kay and my sister. I know that evil has no race or religious boundaries. The kind of rage and hatred expressed in the planning and attack is unimaginable. I did have anger towards the men but my faith in God and what He teaches about forgiveness was my guide. He is a God of forgiveness and that forgiveness He extended to me when I was far off and His enemy. I had to forgive these men. They took my sweet sister but anger and [a lack of forgiveness] would only imprison me. Q: I understand that you were married shortly before Kristine was murdered. That must not have been easy, to say the least, on a young marriage. A: I didn’t know that my wedding day would be the last time I would ever see my sweet sister. I had imagined we would share our lives together and celebrate her wedding day too. My heart weeps. God, in His love and mercy, knew, and He brought my husband and I together. We were only married for 11 months before the tragic loss of my sister. As newlyweds, walking this road has been very difficult. We were thrust too soon into the “or for worse” of our wedding vows. … We have come out the other side changed people but together. My husband has lovingly, faithfully and gently walked by my side and supported me through my grief. Q: This is the first time you have opened up about your experience and one could say that you were “outed” by the publication of Kay’s book. How has this been for you? A: It was difficult initially and felt daunting to ponder doing the interview. It meant opening my heart and laying my heart bare. It wasn’t easy and there were tears, but it seemed right. Doing so has brought insight and shows me how far I have come on this journey of grief and how far I still have to go. How have I and do I grieve [over] such a tragedy – one step, one breath, one day, one tear and one prayer at a time. At times grief is intensely private and at times sharing is a step in the healing and recovery. It has also brought a degree of healing as I talked about my sister. I had often wondered in the quietness of my heart how I could honor her and give others a glimpse into who she was, what was important to her and what motivated her: God’s love. I do hope readers, especially in Israel, where she breathed her last breath, as well as Palestinians, know that there is healing, that forgiveness, while radical, is the only path to true lasting freedom and healing for Christians by God’s power and our choice. Kristine loved Israel—the land and the people—and they have survived innumerable atrocities beyond comprehension, over and over. They understand hate in a way Westerners don’t, not that loss and grief are not uncommon to all, but it’s the frequency and intensity, against a people. I hope that both Jews and Palestinians understand and choose a better way—a way of peace, respect and honoring of all life; every life matters and is valuable and precious. All have loved ones; with every life taken the families and world are robbed of their gifts, their right to life:Israeli, Palestinian and every person everywhere.